A while ago I came across an interview with street artist/muralist Kelsey Montague (IG: kelseymontagueart). Immediately I was inspired, and my brain started working out how I could turn those wings into a quilt and how it would look. Once I realized that I was serious about making it into a quilt I knew I needed to get artist permission, especially since I'd like to show this quilt! I emailed Kelsey and explained my idea and asked if using her art as inspiration would be okay. She gave her blessing and I've been itching to start ever since! 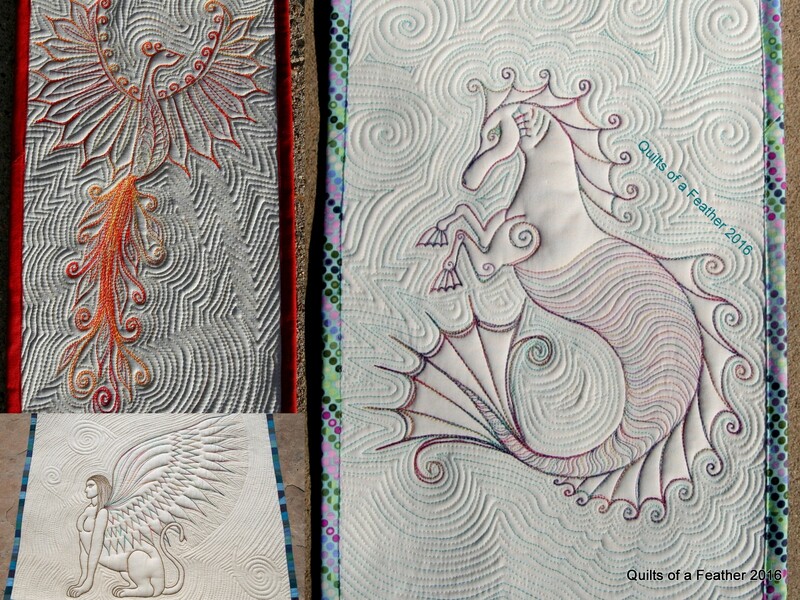 Recent small wholecloth quilts from my Mythological Creature series. So, to get started I finally picked out fabric and threads! I chose to use the new wide backing Luxe sateen solids from Michael Miller and a variety of 28, 40 and 50 weight threads from Aurifil. Michael Miller Luxe in Fog and Charcoal, and a selection of Aurifil threads in teals and greys. Aurifil has generously agreed to sponsor the threads for this project, I am so excited to get the 28 and 40wt threads to play with! Jess and I will be checking in on our progress about once a month, but you can also see real time photos on Instagram (Jess: QuiltyHabit, me: quiltsNfeathers). My next blog post will include the sponsored Aurifil threads and progress on the wings design. Ahh! Seeing your thread and the quilt makes it feel real: that we're actually doing this! ;) I'll aim to have a similar photo and a little progress by next month. Ever since you mentioned the wings to me, I've been itching to see what you do! The Luxe fabrics have a great depth to them, and I am excited to see how the heavier weight thread works for you! This is going to be fun to watch as you and Jess spur each other on. Those wings are fabulous! I can't wait to see how you create them with thread.